A greedy wife (Mary Ellen Trainor) kills her second husband (Marshall Bell) for his insurance money and is then visited by a hideous serial killer (Larry Drake) dressed as Santa Claus and realizes her daughter is in danger. I didn’t get much of that from the actual episode. I had no idea about the second husband or the insurance money. And up and until the psycho Santa Claus, it sounds fairly noiry. But one detail the plot summary misses is the fact that this murderous Saint Nick has escaped from a local mental institution. A popular trope from 1970s and 80s slasher films, paging Michael Myers. What’s more, I imagine Zemeckis was aware of the 1984 b-movie Silent Night, Deadly Night. I’m not sure if this is an updating of an original tale, but as soon as I make my way through all of EC’s Tales from the Crypt I’ll have a better idea of that. This entry was posted in pop culture, television, YouTube and tagged HBO, Tales from the Crypt, YouTube. Bookmark the permalink. Hang on, this is confusing. So the original story appeared in the comic Vault of Horror. You can see some scans of it here, among other places. It was reprinted in a 1964 anthology, Tales from the Crypt. No, I don’t know why a story from Vault of Horror appeared in an anthology called Tales from the Crypt, just go with it. It then showed up in the Tales from the Crypt movie from 1972 (Joan Collins played the wife). And from there it showed up in the TV series. There was a 1973 film The Vault of Horror, which logically enough mostly adapted stories from the Tales from the Crypt comic. Thanks for the clarification, and I had no idea that archaeology was so old. 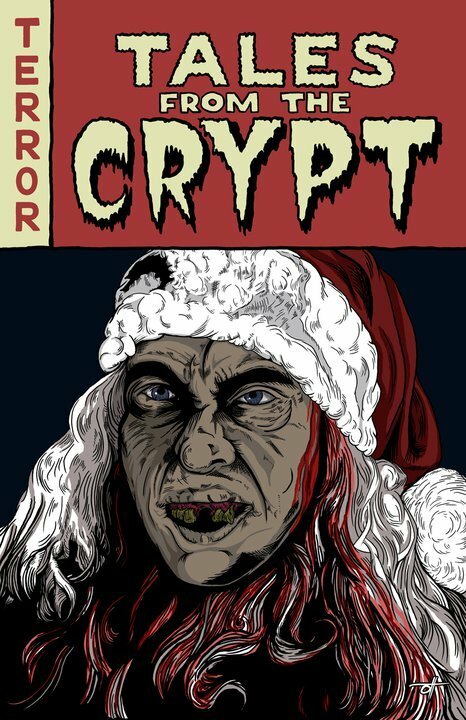 Looks like Silent Night, Deadly Night was stealing from Tales from the Crypt, or is it Vault of Horror 🙂 Your comment is why blogging is awesome, look at all the research you just did for me 🙂 I’ve been wondering about the crossover between Vault of Horror and Tales from the Crypt, so that’s another point of digging. You rule, now I have to follow-up with a comparison of all these renditions.